“Monday the 6th April 1987. Dear Diary. Actually this is not going to be a diary, diary is the wrong word for it. I have been suspicious of diaries anyway, since I stole Amy’s and read them on the roof. Amy, mon âme, my aim, my friend Amy. It was very shocking to read her version of things. No, diaries are stupid. Diaries are all lies. Diaries, they’re so self-indulgent. But we live in self-indulgent times, after all, and for once I want my own twist of it. And if you write something down, it goes away. I’ve been carrying it around with me now for so long it’s taken on a kind of life of its own, I can feel it breathing against me inside my rib-cage, feeding off me, taking all the goodness out of what I eat, all the calcium out of my teeth. I want rid of it. And what a story it could be. What a beautiful, what a romantic, what a passionate story. Like that. Just like that is how Ali Smith hooks me. Every time. The only reason why I give this book 3.5* instead of 4* or 4.5* is that this is her first novel and I have been spoiled by having already read some of her later work, which is much more structured. Like is the story of young love, of obsession, of rejection and resentment, and of healing. The structure of the book – like many of Smith’s – is anything but linear, so reading it is like just going with the flow and trusting the stories to be revealed. It’s a slow start, granted, where we are introduced to Kate and her mother, Amy. Both are elusive characters. But then they have to be, because they are out of place and it is only in the second part of the book, when Ash is introduced that we get to learn more about the mystery. 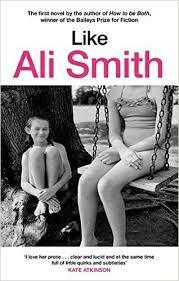 Apart from the characters – all of which I loved – what Smith really succeeds at is being a recorder of the time and place that the characters act in. I have no doubt that some of the scenes are autobiographical or witnesses rather than invented, because I certainly felt right there with the characters in the late 1980s/1990s. And yet, I did not feel that the story was dated. Like is a story in its own time but not exclusively of its time.